Our show begins its new, reboot-y season with Captain Beckett’s first day on the job. (Gates has been promoted, which is sad news for fans of Penny Johnson Jerald.) Castle sweetly wishes her luck before getting back to his PI job after an extensive office remodel. It turns out that Alexis has already solved four of ‘his’ cases, as his associate. Hee. But things quickly take a turn away from the cute/funny when Castle is called in to help Ryan & Espo on their case: four men shot to death in a building slated for renovation. Castle finds a puddle of blood on the balcony where the shooter was. He also finds the bracelet he gave Beckett this morning in the blood. Tests reveal that it is, in fact, hers. Dun dun dun! It’s not much later that Espo, Ryan, & Castle run into Toks Olagundoye’s character, an English PI/’security specialist’ Hayley Shipton. She’s not very forthcoming as to what she’s up to, but she does seem sympathetic to Castle when she learns of his wife’s plight. And she also likes Alexis, so that’s a good sign. (I would say the fact that Alexis likes her is a good sign, too, but there’s Pi, so…) She doesn’t want to cooperate closely with cops, though. She tells Rick that a PI shouldn’t, either. So, Rick and Hayley partner up – but not like that, because Rick is totally focused on finding his wife and Hayley shows zero romantic interest in him. So don’t fret, Caskett fans. Hayley has her own case involving stolen social security numbers, and she’ll help Castle track down Beckett as long as their paths coincide. And their path leads to ex-Senator Bracken, in the perfectly named Winterkill Prison. (Seriously, is that a real prison name?) But while Castle naturally assumes that Bracken has arranged a hit on Kate in revenge for how she destroyed his life, the truth is more complex. Bracken denies that he arranged the hit, but gleefully informs Castle that he really doesn’t know his wife at all. She’s still “tilting at windmills… like a moth to the flame”. Stop mixing your metaphors, Bracken. Then Castle gets captured by the assassin chick we saw kill a guy at the beginning of the ep. She’s a fan of Castle’s books, but not so much that she doesn’t take him to be interrogated by another bad guy. They want to know where Kate Beckett is. And this is the scene. The scene I won’t screencap, or think about too much, because it could literally feature in my worst nightmares. Whatever psychotic Castle writer thought of the bag of tarantulas, I have one thing to say: aaaaaagh! Yeah, I think I like her – and her accent *is* charming. 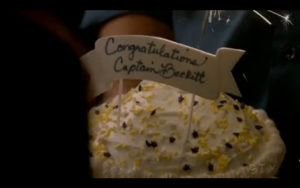 But Castle escapes, and then Beckett swoops in to shoot the assassin chick just before the assassin shoots her husband. Beckett doesn’t stick around to answer any of his questions, though, only telling a bewildered Castle that she loves him. Later, Alexis tells him wisely that she must be protecting him from whatever this mess is, and that he should trust her. I think he will. For now, all we know is that this has something to do with Beckett’s work with the Attorney General’s office. So again: well done, show writers and showrunners. So far, this has the makings of Castle at its best – and after seven seasons, that’s not something I expected. I’ll be here waiting in pleased anticipation for next week. What did you all think of the season opener?